Britain's Adam Peaty said it was about time that he broke his own men's 50-meter breaststroke world-record on Tuesday in the heats of the FINA world championships in Budapest. 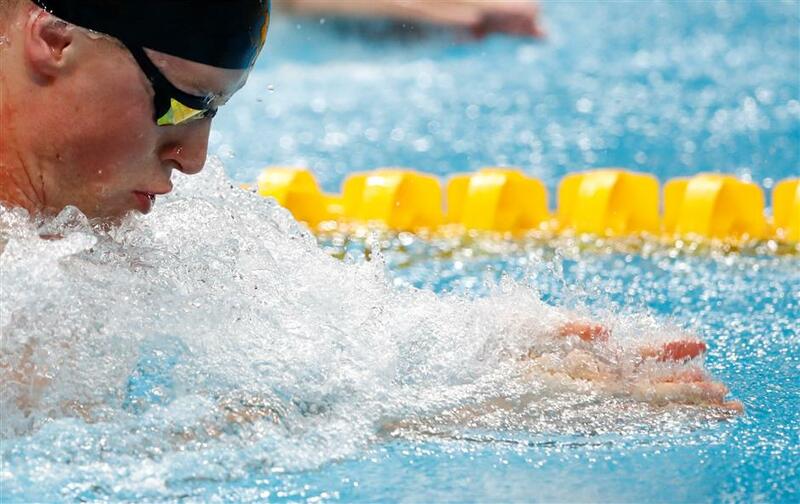 Adam Peaty of Britain competes in a 50-meter breaststroke heat en route to setting a new world record of 26.10 seconds at the FINA world championships in Budapest, Hungary, on July 25, 2017. Britain's Adam Peaty said it was about time that he broke his own men's 50-meter breaststroke world-record on Tuesday in the heats of the FINA world championships. The 22-year-old clocked 26.10 seconds, lowering his own mark of 26.42 set two years ago in the semifinals of the world championships in Kazan, Russia, on his way to winning the final. Fresh from winning the men’s 100 breaststroke gold on Monday night, Peaty blasted out his world-record time to qualify for Tuesday night's semifinals. His main rival in Wednesday’s final looks to be Cameron van der Burgh, who was only 0.44 seconds behind Peaty in the heats. Kevin Cordes of the United States, the 50 bronze medalist in 2015, and Brazil’s Joao Gomes were also within a second of Peaty’s time in the heats. Van der Burgh, the 50 silver medalist two years ago, was unimpressed with Peaty's time.